Family-friendly and guaranteed to fascinate visitors of all ages, Science World at TELUS World of Science is a hands-on educational science museum in the heart of False Creek in Vancouver, BC. Instantly recognizable thanks to its unique globular ‘golf ball’ design, Science World has been inspiring young scientists since opening in 1989, with more than 13 million visitors passing through the exhibits over the years. 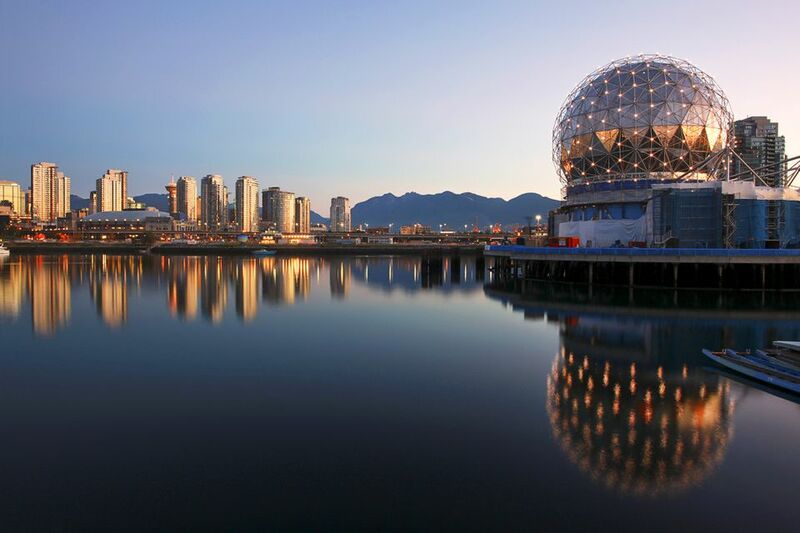 Science World’s iconic geodesic dome was originally built for the Expo 86 World Fair and following the end of the celebrations, it doubled in size from 55,000 square feet to 100,000 square feet. Opening in the late 1980s, Science World expanded again in 2001 with the addition of Kidspace (a gallery for ages 2 to 6), the state-of-the-art Science Theatre, and Our World Gallery. The Eureka! Gallery opened in 2002 and BodyWorks in 2007. In 2004, a $9m deal with TELUS saw the False Creek facility renamed as TELUS World of Science and since then, the center has added a unique outdoor science area, as well as renovating and increasing the size of the galleries. Today it’s still an important and well loved part of the cityscape of Downtown Vancouver. Hands-on interactive galleries include the physics-focused Eureka! Gallery, Our World: BMO Sustainability Gallery, and Kidspace for little budding scientists. Learn more about science-based facts at the Peter Brown Family Centre Stage in the Science Theatre, or in one of the four teaching labs/classrooms. Be sure to see the fascinating BodyWorks, an exhibit of human and animal life below the skin, and take in a show at the OMNIMAX Theatre—at an incredible five stories high and 27 meters in diameter, the theater is the largest OMNIMAX screen in the world, and the awesome wrap-around digital sound system has to be heard to be believed. Recent special exhibitions have included The Science Behind Pixar and A Mirror Maze: Numbers in Nature. The Pixar exhibit explored how technology helped to create the beloved animated films and Mirror Maze looked at math patterns in the natural world. Special exhibits are included in the general admission price. Check out the science-themed gift shop at Kaleidoscope, grab a snack at SnackLab’s concession stand, or enjoy a burger from Triple O’s restaurant. Adults can attend one of the monthly Science World After Dark events where visitors can enjoy a wine or beer as they explore the exhibits in a kid-free evening of science-themed fun. Younger visitors can also enjoy an extended evening of fun with the Twilight Tuesdays throughout the summer, which features a movie at the OMNIMAX after hours. Situated on False Creek, Science World is close to the AquaBus and False Creek Ferries that chug up and down the picturesque creek. Take a ride on the small ferry all the way down to Yaletown, Granville Island, or even Kitsilano Beach and Vanier Park. If you’d rather be in control of steering yourself, then it’s possible to rent a kayak nearby from Olympic Village and explore False Creek under paddle power. Olympic Village is within walking distance and is home to bars and restaurants that make a good post-Science World stop for a lunch or sunset supper. Main Street’s vintage shops and funky restaurants are also only a 15-minute walk or quick bus ride (#3) away. Across the road from Science World is the Main Street Skytrain Station, which connects Downtown Vancouver to the transit system across the Lower Mainland, via the Millennium Line. Multiple buses also stop nearby at Main Street Station or at Olympic Village. Olympic Village Skytrain station, part of the Canada Line network, is only a short stroll away and this connects the city to Richmond, YVR Airport and beyond. In the summer, Science World is open daily from 10 a.m. to 6 p.m. (9 p.m. on Tuesdays); during other times of the year, it's open 10 a.m. to 5 p.m. Monday through Friday and 10 a.m. to 6 p.m. on weekends and holidays. It's closed Christmas Day and September 5. Tickets start at $27.15 for adults, $21.70 for seniors and students/youth ages 13 to 18, and $18.10 for children aged 3 to 12 (under threes are free). Check the website for exact opening times and ticket prices.